One of my favorite sides to make during the summer, especially when cooking up some big, fatty, decadent meat, is a succotash. They are light, healthy, flavorful, and easy to make… and they definitely make you feel a little less bad about yourself after you’ve eaten over a pound of country style ribs or a porterhouse steak! LOL! You can make this right before serving your meal… total prep & cook time is roughly 30-40 minutes depending how well you manage your time between the grill and the kitchen. 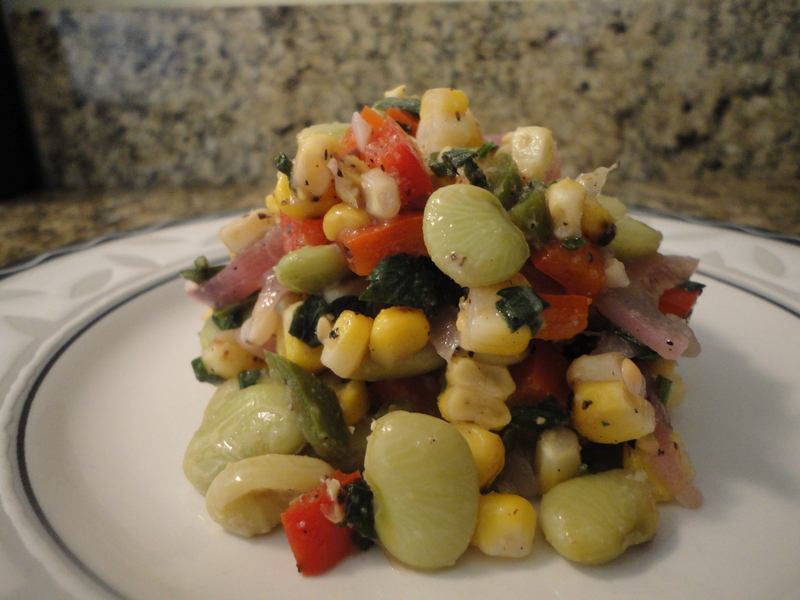 Or, if you prefer, you can make the succotash a day in advance. I wouldn’t recommend further out than that as the vinegar will start to overwhelm the vegetables. First things first, you need to grill the corn. Peel back the husk on the ears of corn, but keep them attached. Remove the silk from the corn and rinse them off to get any remaining silk that you missed. Soak the corn in a bowl with salt and warm water for 10-15 minutes, this softens the kernels. Once soaked, remove from the bowl and shake off any excess water. Once again peel back the husk and rub the kernels with olive oil, then fold the husks back up to cover the ear. Heat your grill on high and place the ears directly onto the grill (don’t use foil as a buffer). You will cook them for 20 minutes, turning them every 5 minutes. In all likelihood the husks will catch fire while you are grilling the corn… That is fine, in fact, it’s desirable. It will give the corn a great smoky flavor. Just don’t let it run too rampant as you don’t want the kernels completely burnt. Let the fire go for 30 seconds or so, then use tongs to pat it out or remove the flaming husks. Once done remove the corn and allow to cool at room temperature. Once cool enough to handle use a knife to cut the kernels from the ear, and place them in the bowl that you will use to combine ingredients. Second step is to blanch the lima beans (which you can do while the corn is cooking, along with the other chopping, dicing and slicing of veggies!). Bring a pot of salted water to a boil and add your beans. While they are in the water set up a bowl with a combination of ice and water (known as an ice bath). Once the beans start to float drain them and immediately add them to the ice bath. The reason behind doing this is to stop the cooking process to keep the beans crisp and vibrant. If you simply drain them and set them aside at room temperate, or even put them in the fridge, they’ll continue to cook internally for quite some time and become soft and grainy. Once the beans have cooled completely drain them and add them to the corn, along with all of the remaining ingredients. Mix together well so the vinegars and seasoning are evenly coating the vegetables. That’s it, you’re done. Enjoy! Tags: grilled corn, grilling, jalapeno, lima beans, perfect pairings, perfect pairings at home, red bell pepper, sides, succotash, summer. Bookmark the permalink. As always Jen, you rock! Wow! I don’t think I’ve had Succotash since I was a kid! Great looking recipe! 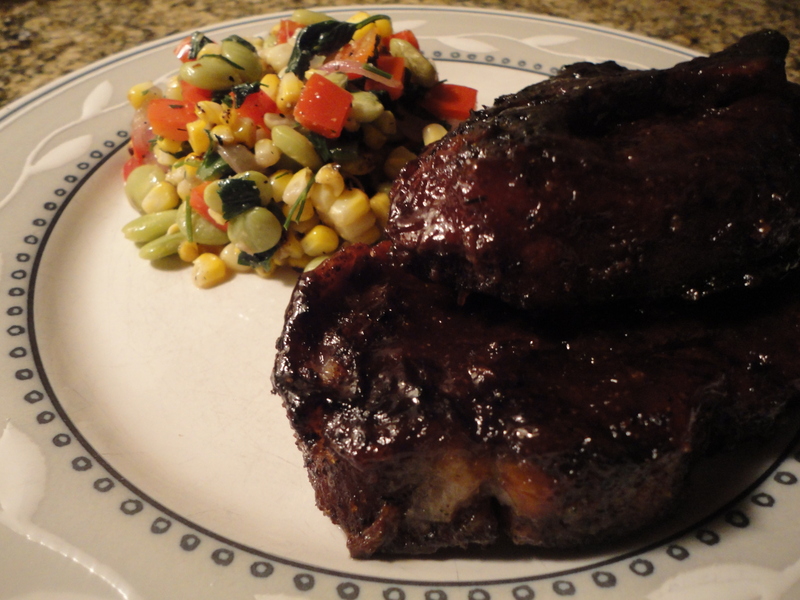 Thanks Martin… can’t go wrong with a little succotash in the summer!